A quick capture to send to Joel and the family in Rome. We are comparing trees. This is a shot using my beta copy of Skitch. Great photo utility and scribbling device. Drove the truck out to Tom’s trees again this year. We have a very dense white spruce. It was the only tree quite tall enough that was left so late in the season. 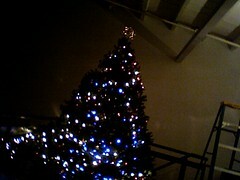 It took 1000 lights to get to a stage where you could see some of the texture of the tree in the dark. We used some LED’s this year you can see the blueness in the shot. I couldn’t find anything that had a warm glow. Finally the stellagassaway.com art site is tied together. A little loosely but tied together none the less. I stayed home from my art studio feeling under the weather a bit and decided it was a good opportunity to try to get all my art related components in a row. I would take my portfolio site and my artlog [blog] and at least make it possible to get from one to the other. Originally I talked about my art here at unpredictable thoughts but it didn’t seem right. My art isn’t unpredictable thoughts. My artlog is an artists journal. Not the deepest of my thoughts; but a dialogue about the art I make and how I do it. It has a meaning to me outside of this blog. My gateway www.stellagassaway.com tells you a bit more about me and my approach to my work with links to my portfolio and to blog. It’s easier to give someone my name domain without any subdomain for the blog and portfolio. More to do but it is a start. This is an amazing moment for me. It takes my breath away. The totally unexpected moment of glass taking a place and seemingly not in contrast to but in harmony with the biosphere. (Found a little chat about the show at my pal Matthew’s blog — worksofman.com .) That it feels natural, welcome, and in need of maybe a little watering is inspirational. I would love to have this piece in my downtown office. This work is currently being shown in Pittsurgh at the Phipps Conservatory. Just remembered how terrific this whole moment was. Gotta love “LIVE” tv. Here’s where he pulls the plug and dives into Radio Radio. (The big story of course is that they were asked NOT to do this song.) Gee wonder why eh? Elvis Costello kicked it. I think Lorne Michaels must have pissed himself. Always have loved Elvis. BUY HANDMADE for the holidays. Support artists and artisans by purchasing handmade and unique works. Skip the malls and support local artists. I’m going to be in my studio this weekend offering some small works at special prices. 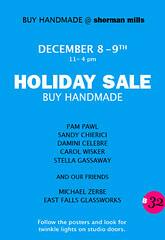 You can visit a number of my b32 buddies and some of the other sherman mills artists. Hope to see you. I couldn’t help it. 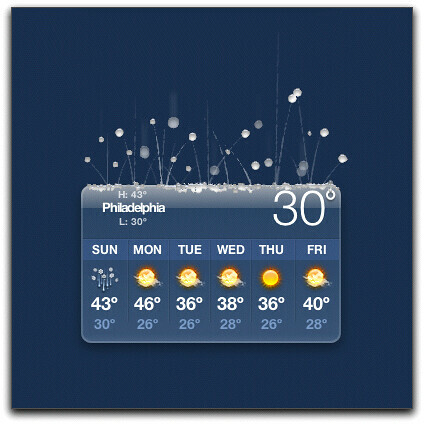 I had to capture the image of my weather widget. The illustrations that have been rendered for the weather conditions always seem so accurate to the experience. I captured this from my desktop late morning. Can you imagine the sound from the ice and rain hitting our skylight? This is what it has been like all day and night. I expect that if the East River Drive isn’t closed now it certainly will be in the morning. It has to be flooded out there. Really, I just had to pay attention to the beauty of this interface. Thank you to the brilliant designers that do this work.